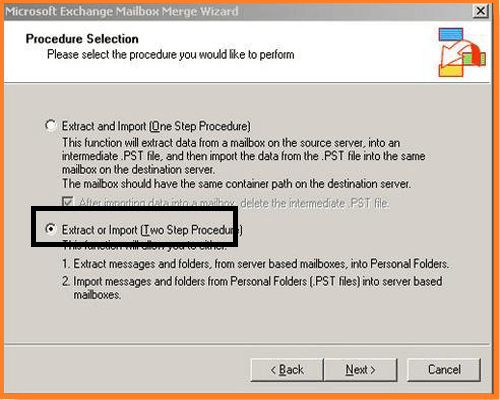 Microsoft Exchange Server Mailbox Merge Wizard (ExMerge) Migrate data from mailboxes stored on source Exchange server and then merge that data into mailboxes on destination server running Exchange. A utility can merge data to and from Exchange Server. 1. ExMerge wizard does not work on front-end servers because such servers do not have a mailbox store . 2. System Requirement to install ExMerge.exe Windows 2000 Service Pack 3 , Windows Server 2003 . 3. Microsoft Exchange Merge Wizard installation is governed by the terms and conditions. If a user does not agree with terms and conditions, the installation fails. 4. Run .exe file from location c:\program files\exchsrvr\bin folder . Note :ExMerge program creates a log file at location C:\Exmerge.log which stores the errors occurred during the installation process . 5) Exchange database is in dirty shut down state etc. 2. Due to Jet Engine and Messaging Application Programming Interface errors . This Error occurs when a user tries to install the latest version of Exchange Server and the files of the previous version are not removed. when a user sends an email, sometimes an error message is encountered ‘the connection was dropped during the transmission’. This error indicates a network connection problem. 5. To meet the business needs email client migration is performed . 6. Exchange server unexpectedly shut down and emails become inaccessible .To maintain the backup of emails stored in .EDB file so that data can be accessed when needed the switch to outlook. 7. Large size Transaction Log file gets created due to large size database . Due to Large size Log file , exchange database file gets corrupted . 8. Exchange store data in one single file whereas in Outlook one Large size PST file can be split into small size PST files . 2. Install ExMerge.exe set-up file by double clicking the file in your system . Start the utility and log in to Exchange server by entering the credentials. After that Microsoft Exchange Mailboxes Merge wizard will get displayed . 4. 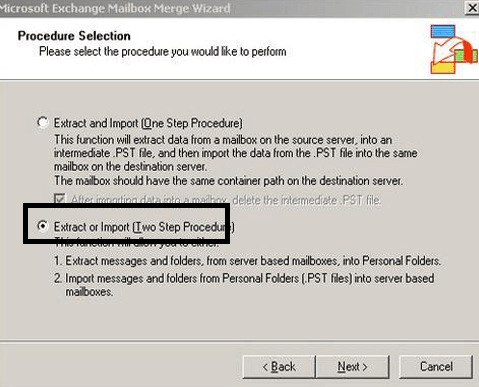 Extract and Import (One – Step Procedure) is selected then click Next. 5. A new window will get displayed Data Selection Criteria. Now click on Import Procedure tab and choose option Archive data to target store. Click OK.
6. Click on Message Details tab in window “Data selection criteria” and enter all the information. Click OK.
7. List of mailboxes is displayed that exist on the exchange server. 8. Select the mailboxes that are to be migrated to Outlook. Click Next. 9. Choose the location where you want to save the converted PST files and select the location by clicking Change Folder button. Click Next. 10. Process status window gets displayed on the screen . It will display how many mailboxes have been migrated. 1. It offers filtering capabilities. 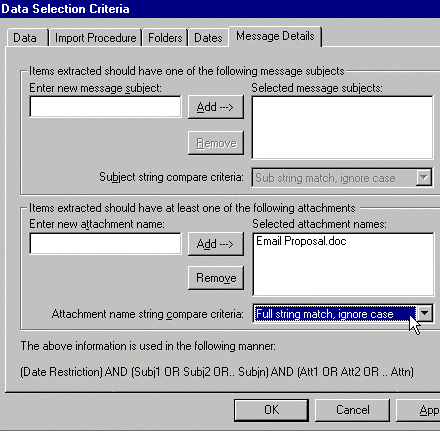 A user can select the emails on the basis of date and time ranges. 2.It is a free utility. 1. 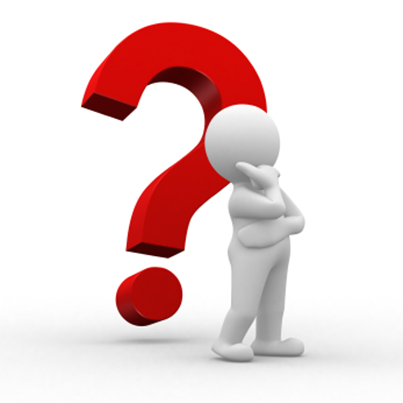 User is using MS Exchange Server 2007 then ExMerge fails . 2. Method is very lengthy and time consuming . 3. Users can only convert Exchange mailbox file of size upto 2 GB . 4. Risk of data loss . 5. Difficult to restore corrupted mailbox items . Manual Method to export mailbox using ExMerge has drawbacks . 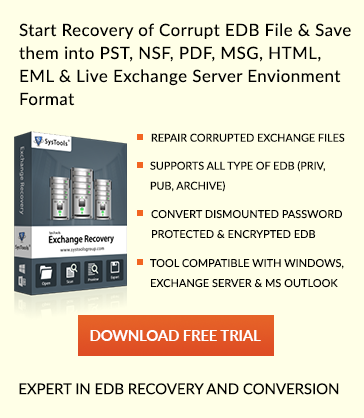 To overcome above drawbacks use a Professional Exchange EDB File to PST Converter . This Perfect Solution helps in error-free conversion , bulk migration of Exchange mailboxes , support all versions of Exchange server . And Also Utility has a user friendly interface and with just few clicks migration process is performed without any data loss . Users can free download demo version of the tool to export mailbox items from Exchange .